The rather temperamental Melbourne sun finally made an appearance earlier this week and I was able to take some better weather photos as promised - in the garden. I love spring – all the previously naked branches and budless vegetable and herb plants have started flowering – with parsley for tabouleh and tomatoes for salsa, I can’t wait for spring to get into full gear. However, even as I look out the window as I type up this tutorial I can see the storm cloud rolling in. Looks like they are about to rain on what was a very good outdoor, makeshift photography studio I had going. I did have the hindsight to photograph at least two projects yesterday. The first project is the Sandi ID wallet, and the second was a matching badge reel which I will post over the weekend. Hopefully, if study permits I will be able to post a lanyard tutorial in case you’re not a badge reel type person. The name of this project is dedicated to one of my friends, whose birthday it was and to whom I owe a present. 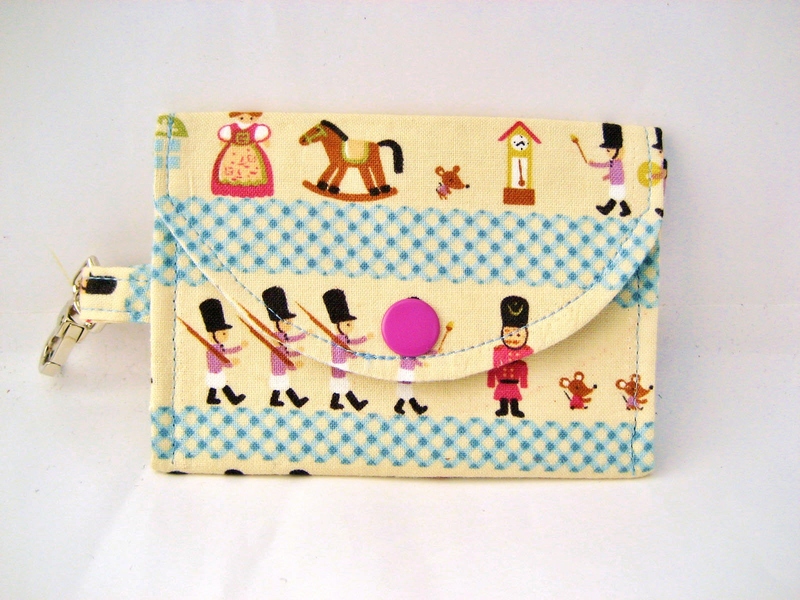 I hope she likes her very own ID wallet and pouch named for her with a matching badge reel. Also just a note on the measurements I only had graph paper in inches for some strange reason, even though I live in a country which uses the metric system, so please bare with me if I accidentally switch between the two at any point. One of my lovely readers Eli made a template that everyone can use instead of squinting at the picture above. To download the template all you need to is click on the image to view it in its original size, download and print it. Grab the interfacing pieces. You will need to trim 1cm (~0.4”) off around the outside of the interfacing so that when you iron the interfacing onto the outer fabric you will be able to see the fabric. Iron the interfacing on with the shiny face sticking to the wrong side of your outer fabric. Now iron the interfacing to the lining fabric. Grab the outer fabric strip for the hook (I really have no idea what to call this), and fold in half and iron. Unfold and fold the edges into the centre seam you have just ironed. Now fold in half again. You should have a strip of fabric ¼ the size of what you started with. Before you sew both sides of the strip, thread it through the base of your hook to make sure it fits. If not you will need to unfold, trim and start again. Now sew up both sides of the fabric strip. Put the hook and fabric aside and grab your outer + lining fabric pieces. 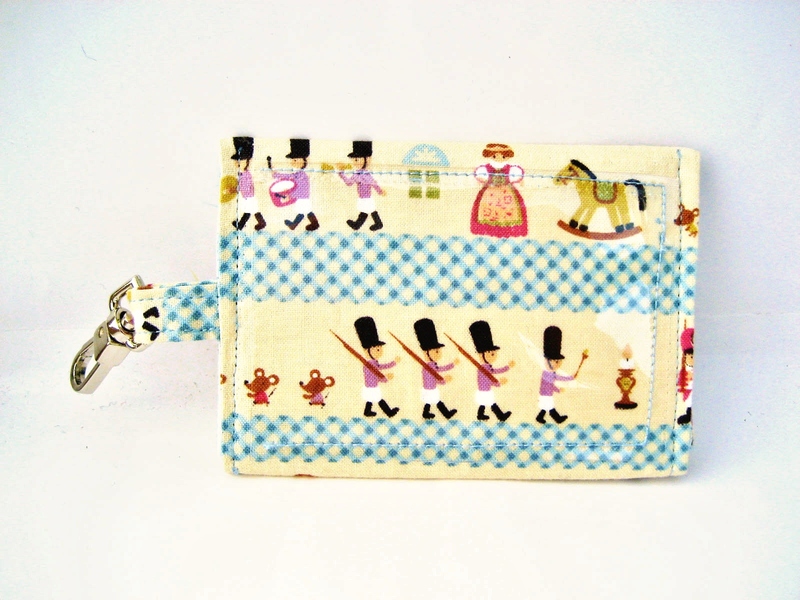 Place your outer and lining fabric pieces together, wrong sides together - so that the good sides face out as they would well the wallet is complete. Fold the rectangle end of the wallet up 3", and fold the flap down 2.5". 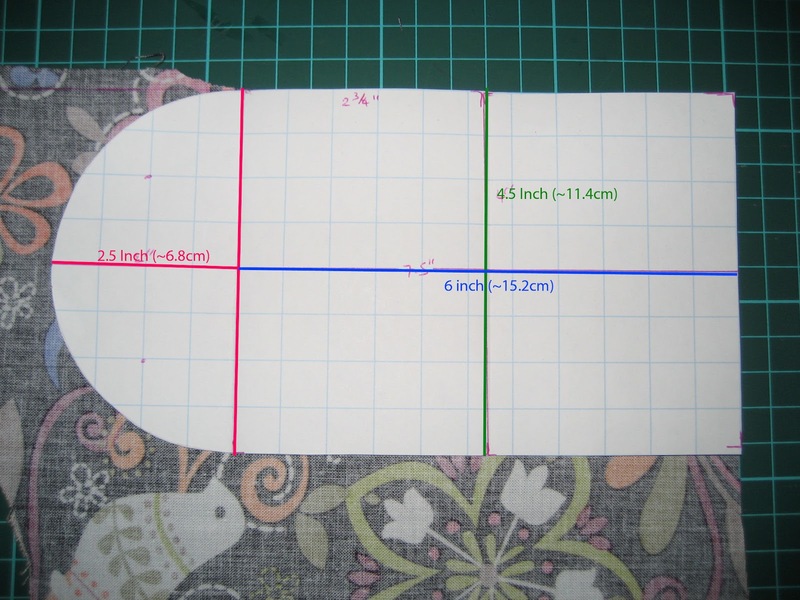 Basically you need to fold along the pink and green lines drawn on the template paper. Iron along the fold lines. By ironing along the folds you have now divided the wallet into thirds. 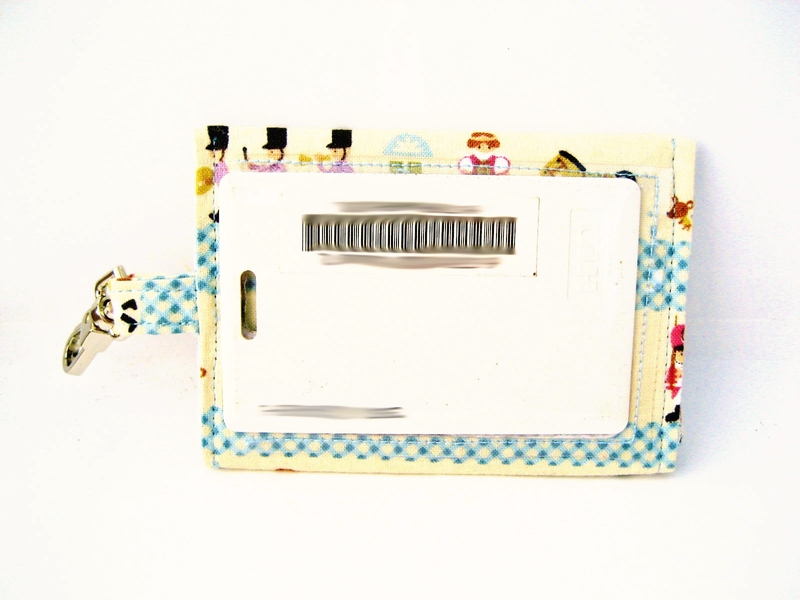 Grab the clear vinyl ID pocket and attach it (with clips, as pins tend to permanently mark the vinyl) to the middle third of the outer fabric. Make sure to really go back and forth over the start and finishing of your stitching, to really attach the vinyl to the outer fabric, otherwise it comes a bit loose. 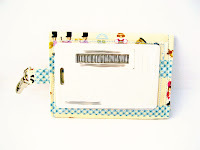 If you have a newer machine choose your triple stitch function - it's rather pretty and super secure. Now in the picture above, find the halfway point and mentally mark it. You need to place the fabric strip and hook in the middle of this image. I found a rather blurry picture of this, but will probably help your imagination more than my lack luster descriptive skills. Now place the outer fabric piece and the lining piece, good sides facing each other - sandwiching the hook in-between. With both pieces sandwiched together pin, pin, pin around the outside. When I sew a piece good sides together, and need to turn it through a slip hole, I find the easiest way to do so is to sew the whole thing shut and then unpick where I want the hole to be so that there is a line to follow when topstitching. 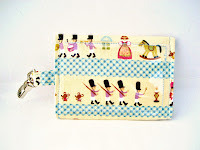 Once sewn and a some stitches have been unpicked, pull the wallet through the lining so the good sides are facing out. Iron the wallet nice and flat and push the edges of the hole back into the lining. Be careful when ironing not to iron over the vinyl pocket on a high iron setting, even when ironing through the lining. Either turn down the iron setting or use a cloth to protect the vinyl. Topstitch over the hole to close it. 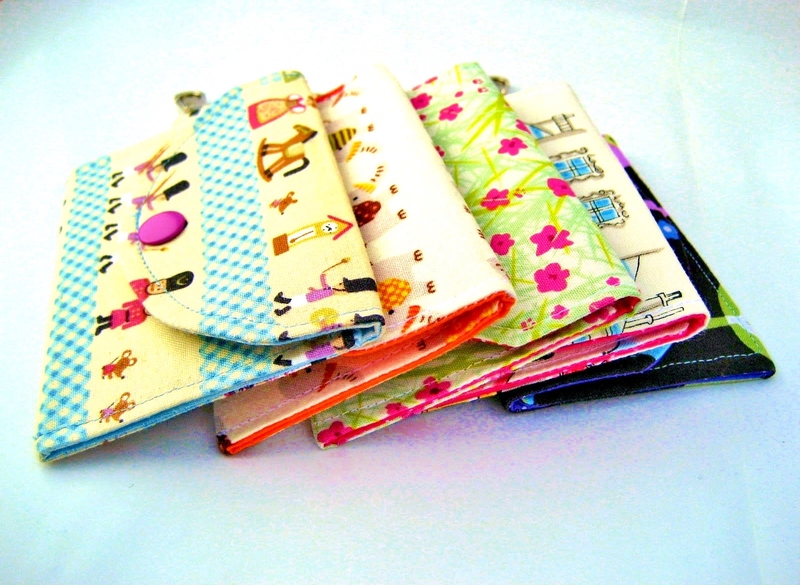 Fold the bottom 3" of the wallet up to form a pouch and press. It will be a bit of a struggle to pin all the layers together so grab whatever is handy to hold the pieces together, clothes pegs would work in a pinch. Topstitch around the whole thing. Now to attach the metal snap button. Given the length of the tutorial and my tendency to prefer pictures over words I have included it in a seperate tutorial which can be found here. Just for reference the coloured metal cap (top prong) and stud should be placed on the flap of the wallet, and the bottom prong and socket on the base of the wallet. Give the wallet a quick press and be careful not to iron over the vinyl as it will melt. If you need to stuff a spare cloth or some fabric inside the pouch to created a barrier between the front of the wallet and vinyl. 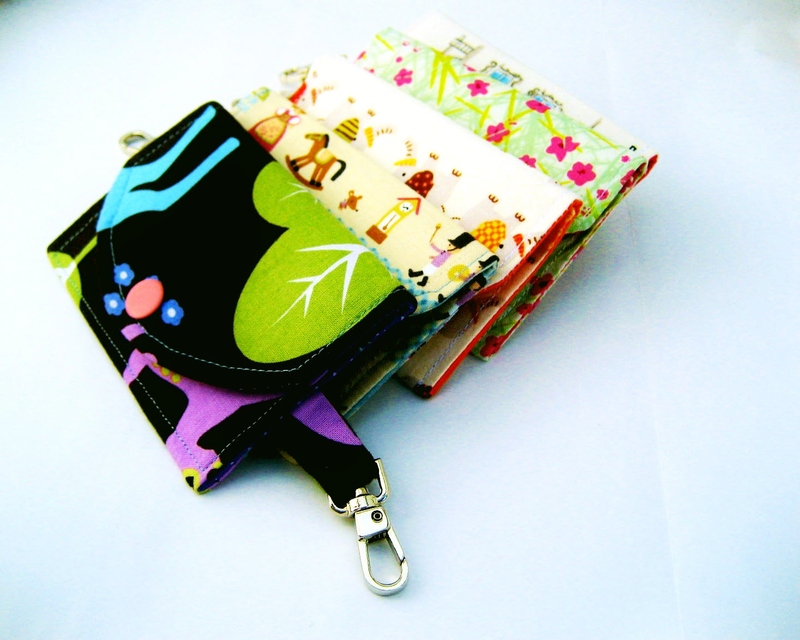 Front of the Sandi ID Wallet - a pouch perfect for keys, coins and hairpins. 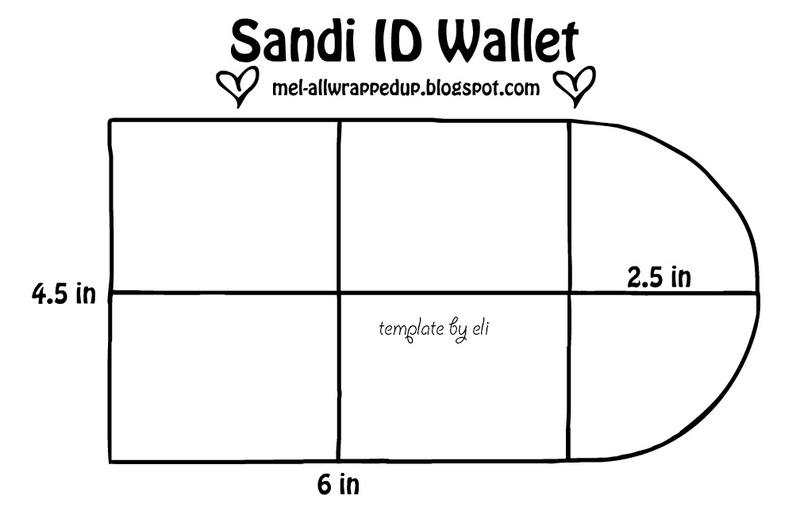 Back of the Sandi ID Wallet - a clear vinyl pocket for IDs. A close up of the back of the Sandi ID Wallet - triple stitched clear vinyl pocket making it extra secure for holding important cards. 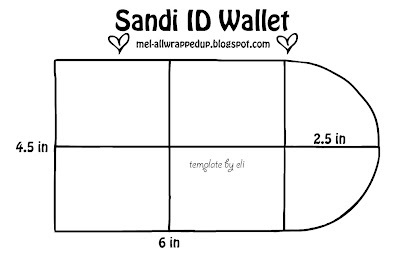 The supplies to make the Sandi ID wallet along with a matching badge reel can be found in a special kit I have put together in my etsy shop All Wrapped Up Craft Supplies. PS. Please do not use this tutorial to produce items for sale, I am happy for you to craft these for yourself and for gifts, but please do not sell them. what a useful item, love the tutorial. thanks for sharing. Thanks for your comments eileen sideways. Hopefully you will be inspired to make on too? Please post a link to it and I will be happy to feature it on my site! excellent tutorial.. i have been looking for exactly something like this. thank you! and thank you for the snap button tutorial.. i've always been afraid of them, but your way seems really easy. will tell you how it turned out! Thanks for your lovely comments. I always love finding blogs in different languages, although google translate can be very confusing. Your blog is very beautiful and you have made some beautiful things. I would love for you to translate the tutorial so that other people will be able to read it too. Please post a link to the translation for me when you are done as I would love to see it. I will send you a link when I post it. obrigada pelo tutorial é tudo muito bem explicado. Com certeza farei uma para mim. Thank you very much for your lovely comments. I would love to see your version of the ID wallet once you have made it and any comments to improve the tutorial as well. Thank you for stopping by and taking the time to comment. I would love to see your finished version and will be happy to post it on my blog! Thanks so much for stopping by and taking the time to comment. It's lovely to know that that the tutorial is appreciated - a very warm and fuzzy feeling for sure. Hope to hear more for you soon! Great tutorial! Thanks for sharing! Thanks so much for stopping by and taking the time to comment. Hope to see your version of the project soon...maybe? What a smart cookie you are! I've had one of these in my head for a long time and you just brought it to life! Thanks for the template-I'm a pattern kind of gal so I love that template! Thank you! Thanks so much for stopping by and taking the time to comment. I completely understand what you mean when you have that ah-ha moment when you see something that's been been rattling around in your head. And the template was made by one of my lovely readers, which was very thoughtful of her. I'm glad you enjoy the project and hope I did the idea in your head justice. We wrote back and forth several times when I was ordering supplies from you. This past Saturday I receive my order. I'm in the process of cutting and sewing the ID wallet. I have one comment about making the strap for the clasp. I cut the fabric 1 1/2 inch wide and then continued following you instructions. Not sure if you included this or not, but I didn't see it. Thank you again for all of you help. - Grab the outer fabric strip for the hook (I really have no idea what to call this), and fold in half and iron. - Unfold and fold the edges into the centre seam you have just ironed. - Now fold in half again. - You should have a strip of fabric ¼ the size of what you started with. - Before you sew both sides of the strip, thread it through the base of your hook to make sure it fits. If not you will need to unfold, trim and start again. - Now sew up both sides of the fabric strip. I'm a young teenager (13) and I love sewing and making crafts like these. Thank you so much for this tutorial- it's great! 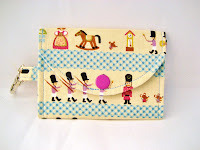 It's my goal to have a craft blog just like you when I grow up! Thanks for stopping by and commenting. I'm so sorry it has taken me so long to reply, for some reason I'm not getting notified when I get comments, even though I tried to fix it before! I'm so glad you like my blog, I try and keep it up to date as much as possible before real life requires my attention again. Tehehhe. I had a look at your blog too, one day when I have time, I'm going to attempt a quilt, but the idea of cutting into all the fabric and having to be so precise scares me...a lot. I am laying sick in bed, and found your Blog. Surely one I am looking forward to follow. And a very good tutorial you have made here. I love laying in bed/on the couch searching out craft inspiration, sometimes its better than crafting itself. Hope you found the tutorial helpful. Thanks for your lovely words, hope I can keep the site updated for you to visit.